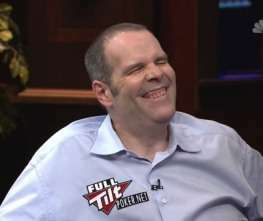 Former Full Tilt Poker board member and prominent owner Howard Lederer has reached a civil settlement with the Department of Justice over alleged money laundering conducted through the site, according to court documents filed yesterday. An exact dollar value for the settlement was not disclosed, though its valuation appears to be significantly less than the $42.5 million the government initially sought. A Las Vegas Review Journal report pegs the settlement at “more than $2.5 million,” without attempting to define a value on a couple of large overseas bank accounts relinquished by Lederer, including one used as a retirement account. The total valuation of Lederer’s forfeiture settlement may be closer to $10 million than $2.5 million, but it still represents a victory for Lederer, who lost no time in inviting 150 of his closest friends to a holiday bash at his Vegas mansion. Lederer’s Hawk Ridge mansion and even larger guest property on adjacent Skybird Court on the far southwestern edge of metro Vegas remain Lederer’s as part of the agreement, and the valuation of those two properties alone is well into eight figures. e. $30,000 in United States currency, representing proceeds traceable to the sale of the Fawn Chase Property. f. All proceeds traceable to the sale of the Twin Palms Property, less any outstanding mortgage amount owed, provided that the Twin Palms Property is sold within 120 days from the entry of this Stipulation and Order of Settlement for a price not less than $440,000. Alternatively, if the Twin Palms Property is not sold during that time period for an amount not less than $440,000, the Twins Palm Property itself shall be forfeited to the United States (collectively, the “Forfeited Property”). Lederer agrees to take all necessary steps to facilitate the immediate transfer of the Forfeited Property to the U.S. Marshals Service. 2. Lederer agrees to immediately liquidate all funds and other assets in his remaining accounts at Lloyds, which (not including the Lloyds 0402 Account) have a current total approximate U.S. dollar value of $168,000 (the “Liquidated Funds”). 3. Lederer agrees to the entry of a civil money laundering penalty judgment in the amount of $1.25 million (the “Additional Funds”) , plus the Liquidated Funds (together, the “Money Judgment Funds”), and to the forfeiture of the Money Judgment Funds for disposition according to law, pursuant to Title 18, United States Code, Section 981, without admitting any liability thereunder. Within three days of the liquidation of the Liquidated Funds, Lederer shall pay to the United States the full value of the Liquidated Funds. Within three days of the entry of this Stipulation and Order of Settlement, Lederer shall execute a promissory note for the Additional Funds (the “Note”). The Note shall specify that $500,000 of the Additional Funds shall be due no later than 18 months from the date of the entry of this Stipulation and Order of Settlement and that the remaining $750,000 shall be due no later than 36 months from the date of the entry of this Stipulation and Order of Settlement. The Note shall be secured by the Skybird Property and the Hawk Ridge Property. The Note shall specify, and it is hereby ordered, that if either or both of those properties is sold within 36 months of the date of the entry of this Stipulation and Order of Settlement, the entire $1.25 million shall be due and owning immediately upon such sale. The Lloyds account is the primary overseas retirement account of Lederer’s, and though its value has been omitted from most news report, it is probably a significant amount. Yet property-wise, Lederer gets to keep most of his ill-gotten riches, which is disgusting to most onlookers. He’s surrendering the retro Shelby collector car, but retaining his mini-fleet of late-model Audis, and he’s surrendering a couple of minor Vegas properties in exchange for keeping the $12-15 million of worth in his manse and nearby guesthouse. Apparently paying for the taxes and upkeep on what’s left won’t be so hard, either. Just last week, Diamond Flush released her summary of the Lederer Files background. The poorly written summary buried its important info well down in the piece, but the new take-home item within was that the numbers at Full Tilt didn’t add up. According to Diamond Flush, despite all the lavish parties and unpaid loans to FTP players and friends and the ridiculous graft, there was still something close to $200 million in FTP corporate funds that went missing and remains unaccounted for. There’s really no other place to look for that missing $200 million other than FTP’s controlling unholy trinity of Lederer, Chris Ferguson and Ray Bitar, and it’s safe to assume that it’s another pile of $-loot-$ that’s been safely laundered by this time. Given that Bitar is the only one who will likely serve any jail time, it’s quite possible that Lederer and Ferguson will look upon all this as an irregularly-formed sale of Full Tilt to PokerStars that just happened to involve the government. It represented an end to the FTP money train, but that was going to happen all along — and what the heck, they weren’t the ones who got hurt, were they? The Black Friday cases against online poker continue to wind down. In related court documents, Chris Ferguson appears to be negotiating a similar settlement, which will leave only the negotiation of an acceptable forfeiture/prison vacation for Bitar to close the door on Full Tilt Poker.